Prescriptions can be incredibly expensive. For our family we have good insurance, but we don’t have any prescription coverage. There are a number of ways to save though so it hasn’t hit us that hard. Before we get into store deals programs, your first step in saving money is to tell your doctor that you don’t have prescription coverage. For many illnesses there are a number of medications that will work, this lets your doctor know that you need something that has a generic option. You may also find that they have free samples that they can send you home with to help cover some of the days you need the medication. Many pharmacies will at one time or another offer gift cards when you transfer a prescription or start a prescription with them. This is money that goes right back in your pocket! If you find this gift card offer in the form of a coupon (sometimes in the Kmart weekly ad and other places) you can always see if another store will honor the same deal and give you a gift card to fill with them. A number of places have a rewards set up to encourage you to remain loyal. At the drugstores you can earn rewards on your prescription purchases that will act like money off on other purchases in the store. A number of grocery stores will give you fuel savings if they run a gas savings program. These rewards can seem insignificant because it doesn’t come back as cash, but they will definitely help save you money. Several stores have a price matching policy that helps you to get the lowest price all in one place. Kroger, Target, and Walmart are three of the larger stores that have this policy. My best advice for this method is to call around and write down each stores price. You’ll probably find that small mom and pop pharmacies have the best prices. Take those prices to your store and ask them to price match. (I tend to do this with Kroger, so that we get the lowest price and earn gas savings). If you’re in need of antibiotics or diabetic medicine, check out Publix. They offer Free Lisinopril, Select Antibiotics, & Metformin. There are no forms to fill out and it doesn’t matter who you’re insurance provider is, Publix will give these to you for free. No limit on refills either! If you don’t have a Publix near you, many stores offer discounted prices on select prescriptions like Walmart’s $4 prescriptions. Next time you see your doctor ask them to write your prescription to allow for 90 days supplies. This will let you take advantage of 3 month prescriptions which can be a significant savings depending on the program you use. Many stores also offer home mailing programs, will free shipping (perfect if your nearest store is still a far drive). If you have no coverage for prescriptions there are a few programs that you can turn to. Many were started by pharmaceutical companies and give discounts on specific medications only, but if your medication is one of them you could save up to 45% off! Also check with your pharmacy, many stores offer a pharmacy discount program that you can pay to be a member of. Both CVS and Walgreens offer this locally. You pay $15-$30 per year and get a discount on all eligible prescriptions. Walgreens is nice in that they tell you what your price would be with their program up front so you know if it will save you any money before paying. 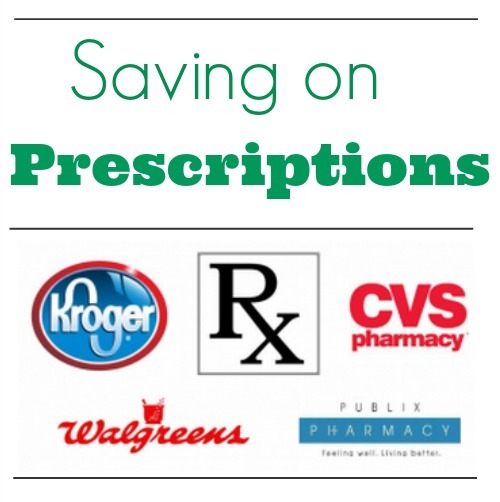 What tips do you use to save money on prescriptions?